Counting to 30 is a big task for kindergarteners. 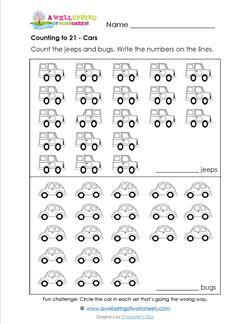 These counting numbers 21-30 worksheets have two to three sets per page. Each page targets counting to one specific number, so all the sets on that page will have the same number of objects is each set. 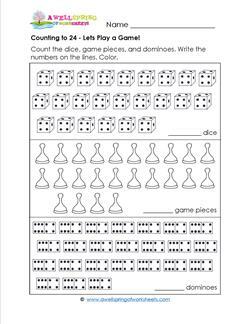 Great practice for kindergarteners who are doing really well with counting and need an extra challenge. 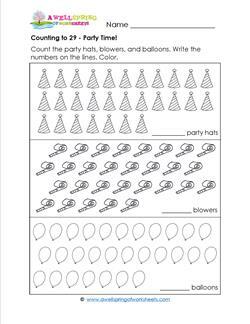 Worksheet themes include cars, hats, sweets, veggies, looking for clues, sailing, game pieces, and more! 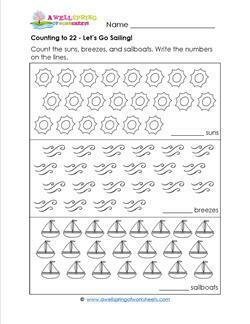 Counting to 22 – Let’s Go Sailing! Counting to 22 is for a bright sunny day (or at least pretending it's a bright sunny day!). Count the suns, breezes, and sailboats. Write the numbers on the lines. Color. While counting to 23 kids can learn what detectives look for - clues! 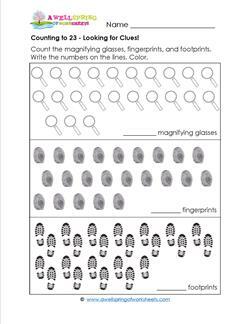 Count the magnifying glasses, fingerprints, and footprints. Counting to 24 – Let’s Play a Game! As they are counting to 24 kids can talk about what games these playing pieces are used for. Count the dice, game pieces, and dominoes. Write the numbers & color. Counting to 25 is sweet for sure! And in more ways than one. 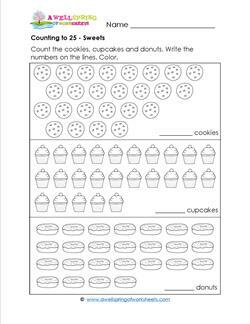 Have kids count the cookies, cupcakes, and donuts. Write the numbers on the lines. Color. No matter what kind of person you are, there's a hat for you. 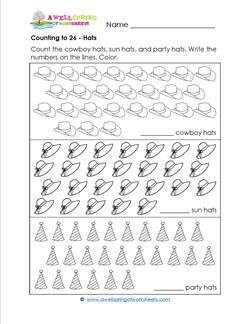 Counting to 26 have kids count the cowboy hats, sun hats, and party hats. Write the numbers on the lines. Color. Counting to 27 is the thing to do no matter what mood you're in! 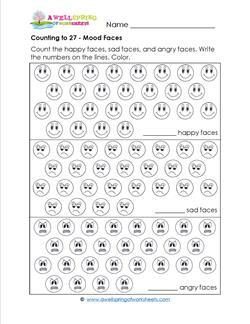 Have kids count the happy faces, sad faces, and angry faces. Write the numbers on the lines. Color. Veggies are awesome, but 28 of each is too much! Save some for lunch - yum. 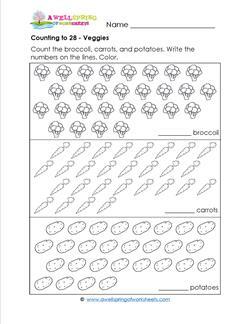 Counting to 28, have kids write the number of broccoli, carrots, and potatoes on the lines. Color. Counting to 29 is getting up there. I think it's time to celebrate! Count the party hats, blowers, and balloons. Write the numbers on the lines. Color. Counting to 30 is key. It's a good number to stop at in kindergarten. 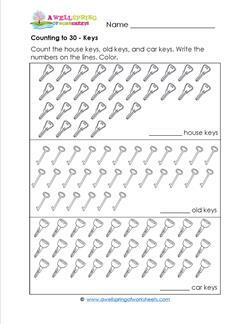 Have kids count the house keys, old keys, and car keys. Write the numbers on the lines. Color.